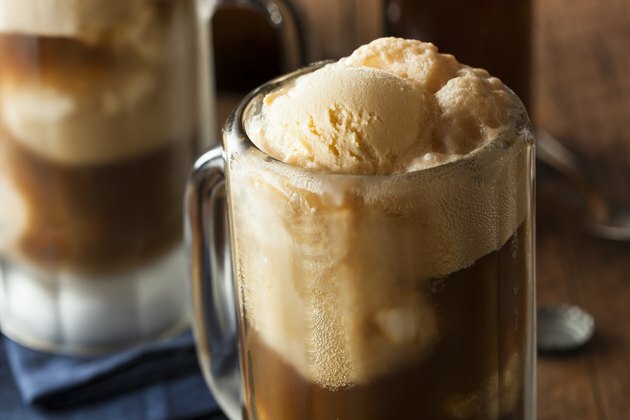 A glass of Barq's Root Beer can be a refreshing way to quench your thirst, or it can be used to prepare a tasty root beer float. Although an occasional soda can be part of your healthy eating plan, regular consumption of root beer may negatively impact your health. MayoClinic.com reports that drinking soda, including root beer, on a regular basis may contribute to obesity, type 2 diabetes, kidney problems and osteoporosis. Learning more about the nutrition of Barq's Root Beer may help you make healthier beverage choices in the future. One of the major problems with consuming root beer on a daily basis is how many calories you add to your diet. If you take in more calories than you burn, the root beer you enjoy so much may lead to unhealthy weight gain. A 12-oz. can of Barq's Root Beer contains 160 calories. If you drink a 16-oz. bottle, you will consume 220 calories, and a 20-oz. bottle will cause you to take in 280 calories. Occasionally, this will not harm your diet, but drinking this much root beer everyday may lead to weight gain, particularly if you drink more than one serving every day. Another concern with drinking soda is that many varieties contain caffeine. MayoClinic.com notes that drinking too much caffeine may cause insomnia, restlessness, irritability or a fast heart beat. If you are worried about your caffeine intake or if you are trying to cut back, Barq's Root Beer may be a better soda choice than traditional colas because it contains very little caffeine. A 12-oz. serving has 15 mg, and a 20-oz. serving has 37 mg.
You should also worry about how much sugar you consume if you drink Barq's Root Beer on a regular basis. Eating food or drinking beverages that contain added sugar can take a negative toll on your health. According to MayoClinic.com, regularly consuming too much added sugar, like the kind found in Barq's Root Beer, may increase your risk of tooth decay and weight gain and increase your triglyceride levels. One 12-oz. serving of Barq's Root Beer contains 45 g of sugar, the 16-oz. serving contains 60 g of sugar and the 20-oz. serving has 75 g.
Although Barq's Root Beer is labeled as a low-sodium food, it does still contain some sodium. If you are trying to lower your sodium intake or if you are on a low-sodium diet, paying attention to the sodium content is important. A 12-oz. serving of Barq's Root Beer has 70 mg, the 16-oz. has 100 mg and the 20-oz. serving has 125 mg. Any size serving of Barq's Root Beer contains insignificant amounts of any other nutrients, including protein, fiber, iron, vitamin C, calcium and vitamin A.